Ordinary fluorescent lamps have an unbalanced spectral color distribution that can be devastating to an artist or designer who is trying to match or reproduce colors. Viewing with a Lumichrome full-spectrum light, however, will produce the highest color rendering index available. 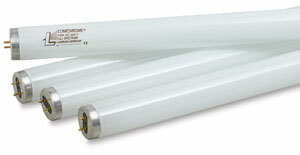 Each carton contains four, 48" long, 40W lamps that fit right into your existing T12 fluorescent fixtures.